Project Management Templates for Excel are purpose built Excel templates for project management that are designed to be applied as generic solutions for projects of any size or nature. The Project Management Templates for Excel are ideal for tasks such as managing a project, monitoring a project, tracking and reporting on a project, or identifying and implementing work productivity and efficiencies. There are 24 Excel templates covering different facets of project management including Gantt charts, time sheets, issue and risk logging, project dashboards, time line charts and project management charts. Create Gantt charts very quickly. Charts update automatically to the project plan. Professional presentation quality of charts. Create time sheets simply and quickly. Add new project participants easily. Professional presentation quality of time sheets. Create issue or risk logs quickly. Present or Track issues and risks intuitively. Allows to focus on project issues rather than Excel development. Professional quality project dashboards presentation. Track and present the entire project status quickly and easily. Presents both macro and micro views of the project. Easy to update on an ongoing basis. Create project time line charts quickly. Easily convey the project story to interested parties. Professional quality presentation of time line charts. Add new project plan items or dates easily. Create project specific charts quickly and easily. Adjust the chart data easily with to automatically update the charts. Professional presentation quality for communication of project dynamics. 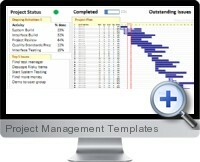 Project Management Templates for Excel are available for Excel 2003, Excel 2007 (or higher) or both.